Showcase is Only a Few Days Away! Are You Ready? Many of you have been asking about our upcoming Spring Showcase. Here is what you need to know! The Joy of Dance Spring Showcase will be held on Saturday, June 20 at 4 p.m at the Queen Elizabeth Theatre. Doors will open at 3:30 p.m.and the show will run for approximately 2 hours. Tickets are $20 and can be purchased at the Joy of Dance reception desk, as well as the box office on the day of the show starting at 3 p.m. Box office will be accepting CASH ONLY. Students performing will NOT need to purchase a ticket. They will be sitting with all of the performers. All of our kids and teen classes will have a rehearsal at the theatre on the same day of the show. The following is a list of the times that both PARENT HELPERS and/or students need to arrive at the theatre. Students WILL NOT BE ALLOWED to be signed in BEFORE the times listed below. 10-12 PARENT HELPER – arrives at 12:25 p.m. CHILD drop off – 12:35 p.m.
7 – 10 PARENT HELPER – arrives at 12:55 p.m. CHILD drop off – 1:05 p.m.
5 – 7 PARENT HELPER – arrives at 2 p.m. CHILD drop off – 2:10 p.m.
3 – 5 PARENT HELPER – arrives at 2:20 p.m. CHILD drop off – 2:30 p.m. Teen classes have their own individual call times. Please check in with your teacher. We suggest that parents pack a small snack (NUT FREE) with your child. Nothing with wrappers or that is messy to eat. Children must be dropped off at the call time given and NOT BEFORE. Children are to arrive IN costume. The TTC streetcar and GO Train have stops adjacent to the theatre. 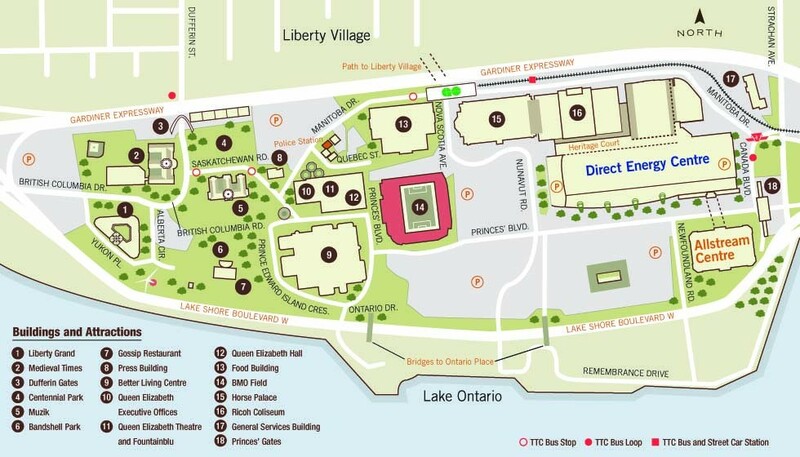 Visit www.ttc.ca and click on TRIP PLANNER for directions from your location to Exhibition Place – Queen Elizabeth Theatre. Visit www.gotransit.com and click TRANSIT TRIP PLANNER by Google for directions from your location to Exhibition Place – Queen Elizabeth Theatre.